Why do you kids live like there's a war on? Author Pat Kirkham discusses the end credits and opening titles for West Side Story, designed by Saul and Elaine Bass, from her authoritative book Saul Bass: A Life in Film and Design. 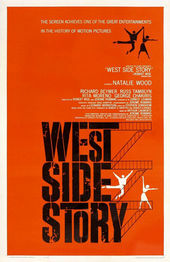 The lengthy credits for West Side Story were shifted to an epilogue, because those for the Broadway musical as well as the film had to be incorporated. This also gave viewers time to compose themselves after the tragic climax. Saul likened the effect to a decompression chamber; "The epilogue is a recapitulation of the environment within which the film's story takes place. Thus all the walls and surfaces (which were part of the background of the story) are intimately explored. As the camera moves over these walls, fences, doors and signs, it discovers, among the graffiti on them, different credits. I had a lot of fun making those credits. Look out for SB & EM in a heart — that's Elaine Makatura, of course — we had just got engaged! And I put the credit 'Music by Leonard Bernstein' on a 'No Left Turn' sign. Figure that one out!" Graphic designer Bob Gill still cites the sequence to students as a "classic" example of title design. "The film is set in the ghettos of New York. It is about a certain time and place and what better way of producing a credit sequence than to take an art form that is so closely associated with that city and with those ghettos. He found a natural canvas and the result was brilliant." Saul was visual consultant on this musical, which retold Shakespeare's Romeo and Juliet in an urban gang milieu. Saul and Elaine created an unusual opening sequence that accompanies Leonard Bernstein's romantic overture. Brilliant, saturated hues slowly change color over a single delicate drawing. The image is indeterminate and abstract, until it dissolves into the tip of the Manhattan skyline and we understand what we have been gazing at all along. Saul was also responsible for directing the superb aerial photography that followed — starting high above the tall buildings and deep canyons of the city and finally zooming down in one seamless take to the teeming streets of New York City.